It occurred, according to tradition, around 13 B.C. 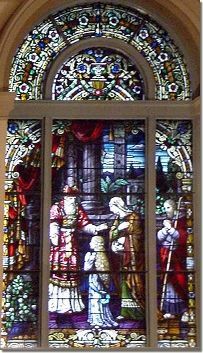 Saints Joachim and Ann, Mary's parents, present their daughter to the temple priest Zechariah. Zechariah was the husband of Elizabeth, who was a cousin of Mary. He would later become the father of St. John the Baptist. This scene of the presentation of Mary in the Temple, which was like a boarding school for her where she learned about Jewish life, happened when Mary was just 3 years old. There she stayed in the Temple, in the cloister of the virgins, praying and adoring God until she reached the age of 14. The Church commemorates this scene on November 21st.